In the state of California, the term "vaccine-friendly" in recent years has grown to mean more than simply being a physician who is willing to accept pediatric patients whose parents either oppose vaccinations or choose not to follow recommended vaccine schedules. Among some pediatricians in the state, the term can be code to inform parents that they're willing to write a medical exemption from school vaccination. It's a service that doctors in the state have begun to advertise since California became the third state in the country to eliminate all philosophical and religious exemptions from school vaccinations. In the year following passage of California's S.B. 277 in 2015, the rate of medical exemptions in California increased sharply, according to research published this week in JAMA. An analysis of medical exemptions among kindergartners showed while the rate of medical exemptions within the state has remained relatively stable for 20 years prior to S.B. 277, the rate jumped from 0.17% to 0.51% during the 2015-16 school year. Meanwhile, the rate of personal-belief exemptions reported decreased from 2.37% in 2015 to 0.56% in 2016. Overall, the total rate of exemptions fell from 2.54% in 2015 to 1.06% in 2016. Study lead author Paul Delamater, an assistant professor of health and medical geography at the University of North Carolina at Chapel Hill, said the sudden rise in medical exemptions seem to suggest that parents were finding doctors who were willing to use a broader scope to justify the need for a medical exemption from vaccinations. A look at exemptions rates on a county-by-county level found areas that had high rates of personal-belief exemptions prior to S.B. 277 had some of the biggest increases in medical exemptions after the law went into effect. "The sentiment among parents that don't want to vaccinate their kids seems to run quite strong," Delamater said. "Doctors did have to play a role in this increase." Based on the study's findings alone, it is impossible to determine for certain whether the rise in medical exemptions was the direct result of parents finding sympathetic doctors. But the numbers raise concerns over whether the spirit of the law is being undermined under the guise of medical necessity. California's law offers a rare look at the real-world effects of regulations addressing the anti-vaccine movement. West Virginia and Mississippi are the only other states that ban religious and personal-belief exemptions, but California is the first in modern times that has passed more-stringent vaccination requirements. Supporters of the California law pointed to recent outbreaks of vaccine-preventable diseases such as measles and pertussis. Despite having an immunization rate at nearly 95%, vaccination rates vary widely throughout the state. Many feel communities where rates fall well below the threshold to maintain herd immunity have been at the heart of recent outbreaks. According to S.B. 277, a doctor only needs to write a letter stating the medical reason why a child should not receive a vaccination to secure the exemption. The doctor's decision comes under no review to ensure that the medical reason for the exemption fits within the scope of more generally accepted medical indications. Children who have already entered kindergarten with a personal-belief exemption prior to the law going into effect were grandfathered in, but they are subject to the new vaccination requirements once they reach seventh grade. A 2016 policy statement by the American Academy of Pediatrics called for eliminating all non-medical vaccination exemptions. 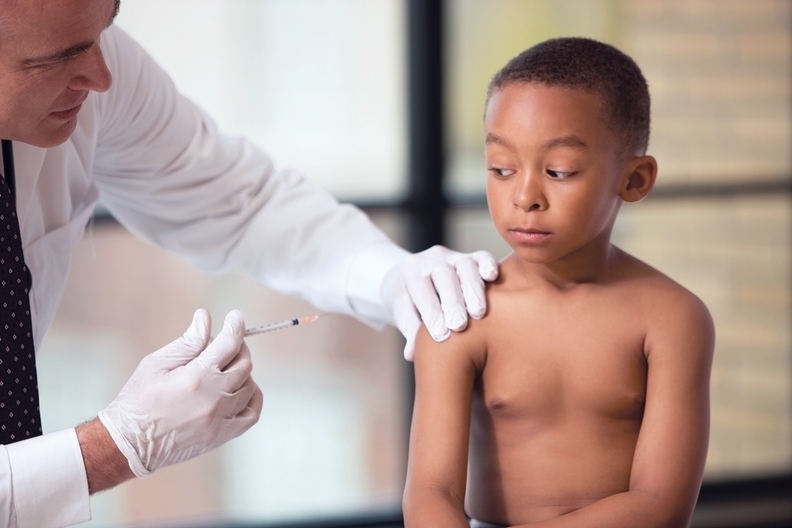 The academy said medical exemptions could include children who had previous adverse reactions to a vaccine or its components or cases where there is an underlying health condition, such as an immunosuppressed organ transplant recipient. "There are relatively few, true medical exemptions from immunization," said Dr. Jesse Hackell, a pediatrician with New York-based Pomona Pediatrics. In 2016 Hackell co-authored a report published in the journal Pediatrics that examined how to address parents' concern about vaccines. "But depending on how one phrases something, you can make almost anything fit as a medical exemption." Some physicians offering medical exemption "consulations" list an array of medical conditions that qualify for vaccination exemption on their websites. Along with having an existing or family history of an adverse reaction to vaccine, other conditions listed have included eczema, asthma, lupus, rheumatoid arthritis, attention deficit disorder and diabetes, to name a few. "Certainly, when you talk about diabetes or asthma, those kids are at higher risk from a lot of vaccine-preventable diseases," Hackell said. "Those are not recognized exemptions." Despite the potential for abuse, Hackell pointed out that doctors that offer such services are not necessarily committing any wrongdoing, since the law leaves it to the discretion of the physician to determine whether a medical exemption is needed. "Quite frankly when you're given a license to practice medicine, you're not being held to the best evidence-based practice," Hackell said. "Doctors are given a fair amount of leeway in what they do before it runs afoul of the medical board." In many instances, Hackell said, social media has made it largely unnecessary for a doctor to advertise they are open to writing a medical exemption. "If someone is available to do this either out of the goodness of their heart or for a fee, word gets around and people who are looking for a particular service will be able to find it," Hackell said. A spokeswoman with the Medical Board of California said the body does not get involved in cases where a doctor is suspected of providing medical exemptions unless a complaint is filed. She said thus far, there has been one complaint made against a physician alleging malpractice due to their decision not to vaccinate. That case is still being investigated. Setting up some sort of regulatory review of medical exemption decisions would be too costly and time-consuming to run, Hackell said. Schools could tackle the issue more effectively by reviewing vaccination exemptions, but even that Hackell admits would put a significant burden on schools. It also raises concerns over whether it would be appropriate for a non-medical entity to get involved with making medical decisions. He said regulatory review and investigation may be an option in cases where there's evidence that doctors are simply selling exemptions to the public. A much harder case to make would be to try to determine the motivations behind every exemption written. "You're not going to clamp down on every single one as long as some doctors have offbeat beliefs and as long as parents put a lot of pressure on them," Hackell said.